When I first saw a Mondrian painting, I got angry. Hands-curled-up-into-fists, eyes-bulging, frowny-faced angry. “What even is this! ?,” I mentally shouted to nobody in particular. “Give me some graph paper and I could do it.” (Full disclaimer: I am a terrible artist. Even if I did have graph paper, I could not come close to emulating the precision of one of Mondrian’s works.) I wandered—stomped—away from the painting, seeking some other work of art that could cool me down. This reaction was probably about ten years ago. I don’t remember where I was, or the precise details of the painting itself, but I do remember my bodily reaction to it. I’ve created a memory of myself as reactor more than passive observer, and that is the memory which has stuck with me through the years. A painting by Mondrian is currently on display at the Phillips, and when I walk by it, the memory of my initial and totally irrational rage floods in—despite the fact that intellectually, I understand the artistry of the painting in front of me. Why did a piece of canvas on a wall inspire such an emotional and physical reaction? What is it about certain works of art that makes us actively respond rather than merely see? This is one of the questions on hand in art theorist Fré Ilgen’s latest book, ARTIST? The Hypothesis of Bodiness, which investigates “the involvement of the (mind/)body in everything we do, think or experience.” Ilgen will discuss his book in a panel moderated by Phillips Director Dorothy Kosinski on October 15 at American University. Have you ever experienced a reaction like this to a work of art, positive or negative? Leave your thoughts in the comments. 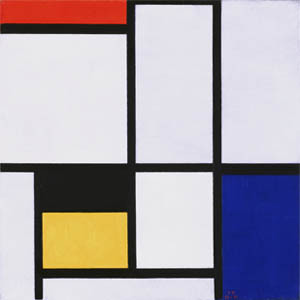 This entry was posted in Experiment Station and tagged emotional art, painting, Piet Mondrian, visceral reaction. Bookmark the permalink.